The Greek physician Galen was one of the originators of the science of anatomy (the study of the structure of living things) and was probably the most important physician of all time. His surviving writings make up about half of all ancient writings on medicine. Various birth dates for Galen, from 127 to 132, have been suggested, but 130 is generally accepted. He was born at Pergamon, Asia Minor, into a wealthy family that valued education. Galen's father, Nicon, was a mathematician, architect, astronomer, and lover of Greek literature. He was Galen's only teacher up to the age of fourteen and a strong role model. In his book On the Passions and Errors of the Soul Galen says he was "fortunate in having the most devoted of fathers," but of his mother he says "she was so very much prone to anger that sometimes she bit her handmaids; she constantly shrieked at my father and fought with him." In his fourteenth year Galen attended lectures given by many different philosophers (people who study and search for knowledge) in Pergamon. He learned something from all of them and thought it was wrong of people to blindly follow everything any one person might say. Later in life he urged physicians to take whatever is useful from wherever they find it and not to follow one school of thought, because that produces "an intellectual slave." Galen claimed to have studied day and night for four years. His first anatomy teacher was Satyrus, a pupil of Quintus, who through his students played a major role in the increase in activity in the field of anatomy that led to Galen's work. Galen's father died in 150, and the following year Galen went to Smyrna (now Izmir, Turkey). While there he wrote his first treatise (argument containing facts and conclusions), On the Movements of the Heart and Lung. In 152 he went to Corinth and on to Alexandria, where he remained for four years studying with Numisianus, Quintus's most famous pupil. Although Galen admired Numisianus, he was not happy with the quality of the lectures or the abilities of his fellow students. During this time Galen produced a number of dictionaries of both literature and medicine. He also started a major work, On Demonstration. Unfortunately, no copy of this work survives. In 157 Galen returned to Pergamon, where the next year he went to work as a physician to the gladiators (people who engaged in fights for public entertainment in ancient times). The injuries the gladiators suffered provided Galen with excellent opportunities to extend his knowledge of anatomy, surgery (operations to correct a disease or condition), and methods of treatment. While working among the gladiators, whose daily lives are described in his writings, Galen produced some of his most original work. In 163 he went to Rome, where his public anatomical demonstrations and his success as a physician made other Roman physicians jealous. Galen was only interested in passing on knowledge as widely and as publicly as possible. 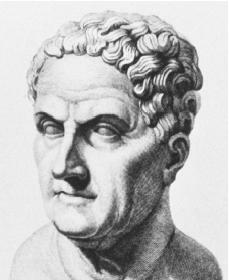 Galen returned to Pergamon in 166. However, a severe outbreak of plague (a bacteria-caused disease that spreads quickly and can cause death) among the Roman troops in Aquileia in 168 caused the emperors Marcus Aurelius (c. 121–180) and Lucius Verus to send for him. In 169 Marcus made Galen physician to his son, Commodus (161–192). During this time Galen completed his major works, On the Usefulness of the Parts of the Body (in seventeen books) and On the Natural Faculties, as well as many other treatises. In 176 Galen returned to Rome permanently. He continued his writing, lecturing, and public demonstrations. In the winter of 191 and 192 a fire destroyed most of Galen's library. Yet in spite of this loss, information about his writings remains because he wrote two treatises on his own books and their order of production. Both works provide a wealth of information on his writings and are major sources of detail about his life. From 179 to his death around 200, Galen continued his medical research and writings, producing such major works as The Method of Cure. During his last years, however, he wrote more nonmedical works, such as On the Equality of Sin and Punishment and The Slight Significance of Popular Honor and Glory. Galen's family name is unknown. Not wanting to cash in on the reputations of his ancestors, he used only his given name. Galen said of himself, "I have worked only for science and truth and for that reason I have avoided placing my name at the beginning of my books." Debru, Armelle. Galen on Pharmacology. New York: E. J. Brill, 1997. Sarton, George. Galen of Pergamon. Lawrence, KS: University of Kansas Press, 1954. Tieleman, Teun. Galen and Chrysippus on the Soul. New York: E. J. Brill, 1996. Walzer, R., trans. Galen on Medical Experiences. London; New York: Oxford University Press, 1944.